A trusted foodie friend has eaten at Borrego de Oro multiple times, and has always spoken very highly about their mole. I LOVE a good mole, and am always on a quest to find good ones. I have made them before myself, but it certainly is time-intensive. I do have a pretty darn good recipe that's "only" about an hour of work once you have all the ingredients; if you're interested, email me. While there are different types of mole sauces (as in, the seven moles of Oaxaca), it's the Coloradito Mole that's the most common amongst Mexican and Tex-Mex places in the US. What attracts me to this mole is its depth of flavors when properly made -- some spice from various chile peppers, nuttiness from ground almonds, sweetness from raisins, a subtle bitter savoriness from chocolate or cocoa powder (or both). It's a huge flavor party, but not everyone appreciates it. So I met a friend at Borrego at 7:30 on a recent weeknight; there was no one dining, but two guys at the counter placing a to go order. The friendly waitress immediately brought me water and warm tortilla chips and salsa, as I waited for my friend, who arrived shortly thereafter. Warm chips are darn addicting and go very well with cold Negra Modelo! After studying the menu, I ordered the chicken mole plate (of course), and my friend got the shrimp fajita plate (a slight misnomer, but we'll let that pass! ); we had our choice of charro or refried beans. The mole turned out to be okay, but not the billing I was lead to believe. My guess is this batch had been sitting in a container in the fridge, and they pulled some out, and heated it up in some oil. It was fairly oily, as can been seen at the top of the plate. The chicken still had it's rubbery skin on, so I pulled that off to the side. Taste-wise, it had some chile in it, so it was a bit spicy, and it was dark brown, so probably some chocolate in there, but there was no real special flavor to it; I couldn't discern any flavor other than chile with a hint of chocolate. No almond, raisin, cinnamon, allspice.... Just kind of meh. The rice & beans were fairly standard for a Tex Mex place. My friend really liked her shrimp dish, though I didn't try it. The two young ladies who were the servers were very friendly. And fortunately, about 4 more tables filled up, so the place wasn't a total ghost town. 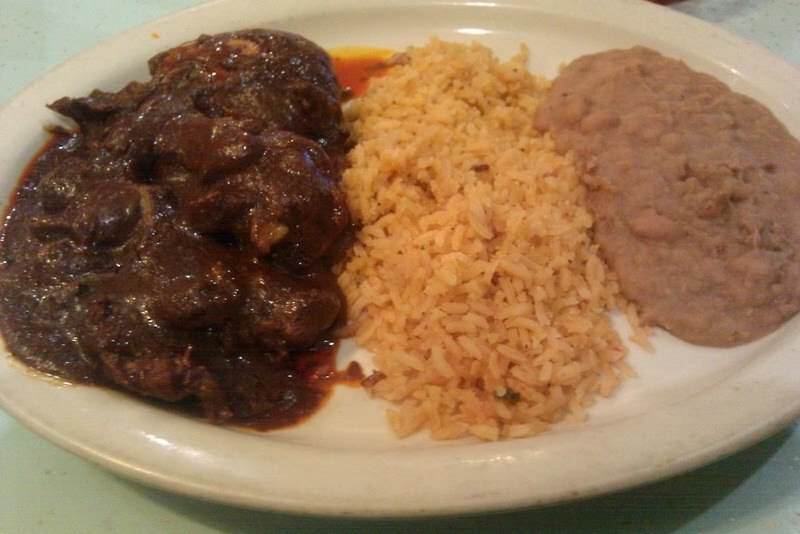 So while the food was fresh, the service really good, and the food came fairly quickly, the mole was a disappointment. Maybe there are other dishes on their menu that are real standouts that I missed. (Have you been?) But if I want really good mole, I'll stick to Manuel's or Sazon or make it myself. And now said friend who I could still SWEAR has raved about their mole (okay, it must be someone else...) says no, no, no, not the mole, the lamb stew dish. So now I need to consider going back for that. Love some good lamb! Hmmm, maybe that's their signature dish, as the place IS called Lamb of Gold.